Worldwide, gold ETFs (Exchange Traded Funds) increased their holdings 8.4% in 2017. Collectively, they now own 2,363 tons, having added 197.5 tons for the year. By comparison, the U.S. Treasury claims to own the world’s largest horde of gold at 8,133.5 tons; Germany, second place, claims 3,373.6 tons. Since 2003, only in 2009 did ETFs add more gold than in 2016, when they added more than 500 tons. The following four years, gold prices soared. In 2013, ETFs dumped huge quantities of gold, and it entered a three-year bear market. 2017 was the second consecutive year that the price of gold advanced from its December 2015 bottom. Yet it remains nearly $600 below its apex in 2011 when it touched $1900. Many analysts assert that the flow of gold in and out of ETFs is a good indicator of future gold price action. They believe that the so-called sophisticated investors (people in positions to know more than average investors) buy ETFs instead of gold bullion coins and gold bars. Looking at the 2008 – 2018 price chart, the massive selling in 2013 lends credence to the theory that ETF selling portends lower prices. Year 2009 suggests that when ETFs are buying, higher prices are ahead. Central banks prefer physical gold not ETFs. In 2017, central bank holdings of gold increased again, with Russia (213.3 tons), Turkey (148.7 tons) and Kazakhstan (37.6 tons) being the largest buyers. That ETF investors bought gold in 2016 and 2017 is a positive development, just as their selling in 2013 was negative. Today, however, the financial markets are fixated on stocks, with the Dow Jones Industrials Average having climbed 25% in 2017; therefore, not much attention is given the yellow metal. 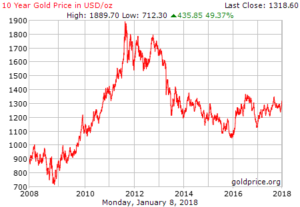 In the face of such fantastic stock action, gold’s price increase of $200 since its December 2015 bottom was impressive and is probably an indication of quiet, big buying of gold, as evidenced by ETF and central bank buying. In January, ETFs collectively added 27.6 tons of gold, a 5% increase, putting their total holdings at 2,396 tons. As a reference, the most ETFs have owned is 2,630 tons in 2012.